By the time we reached the airport, even Athena's expression was worn out. That was meant to be a joke, but Athena suddenly became lively and flashed the peace sign with her fingers. ... I forgot. Athena has impressive guts and stamina, is highly competitive and hates losing. It seems like she really wanted to walk. Athena's worn out expression returned. Athena sighed as she surveyed the area. Just as Athena said, the spacious airport was deserted. To the point where there seemed to be more airport staff and shop employees than actual passengers. 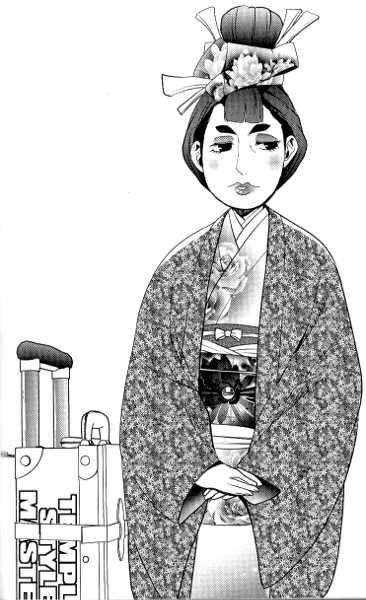 She wore an extravagant kimono and her hair done up with large wooden Japanese hair ornaments. Her thick make up made it hard to pin down her age, but I'd place my guess at somewhere between 30 and 100. The suitcase she had with her had a large logo reading “Temple Style Master” on it. Athena and I moved out of the way. Athena and I left the carry on baggage inspection area and headed for the exit. Athena spoke up in surprise as she turned around. Standing behind us with his unsociable expression was my friend and current chief prosecutor – Miles Edgeworth. Edgeworth magnificently dodged the question with his reply. Edgeworth said without a hint of a smile. Edgeworth spoke matter of factly, but I was taken slightly aback. But before I could open my mouth to voice my questions, Edgeworth spoke. Athena seemed to be talking to herself. Athena has incredible hearing. She can pick up on people's emotions just by hearing their voice, even if they're actively hiding it. There must be some kind of connection between Edgeworth and Mr. Goodwin. Had he done something to piss Edgeworth off? Ramon's home was a ramen shop by the ocean. Its name was “The Flying Spaghetti Master”. While we were heading to the ramen shop, Athena let out a shout. It was the kind of wind where if you weren't careful would blow you over. Athena's long hair fluttered in the wind like the stars and stripes. Anyway, we finally reached “The Flying Spaghetti Master”. Athena faltered for a moment, but she's a true member of the Wright Anything Agency. She made a strong proclamation. Behind the counter was a man wearing a T-shirt with long brown hair that was tied back. This must be Ramon Berger. Ramon pulled out and dumped the noodles in a rush (dangerous!) and turned to us in excitement. Ramon's eyes shone as he introduced himself. ... Apollo, what exactly have you been saying behind my back? Ramon served up a bowl of ramen with a smile, laying them in front of us. Not only that, but he added a large serving of menma. Ramon's voice dropped suddenly, as he gained a serious expression. After making no progress as the airport and Edgeworth's cryptic warning, I was worried that this investigation wasn't going anywhere, but it seems like Ramon will talk to us. Ramon had an overwhelming energy, but it's time I got serious. Ramon twitched in response to my words. Ramon averted his eyes in frustration. ... Good to hear. Ramon does believe in Apollo. He ran his mouth in the heat of the moment and regrets it. Ramon furrowed his brow. I decided to bring up something that had been bothering me. Ramon gulped. I pressed for an answer. According to Apollo, Ramon had grabbed Mr. Goodwin's arm with a grim expression... and Mr. Goodwin had shaken him off and kept walking. Doesn't sound like a friendly greeting to me. Ramon gave an unnaturally quick and definitive response. Ramon shouted to cut off the conversation as he added more menma to our bowls. It doesn't seem we'll get anything else out of Ramon.